Several internet marketers have come out with their own Twitter blueprint or step-by-step method for succeeding in this popular microblogging platform, and Ashley is no exception. He presents a 5-Day Plan which he feels is a more reasonable (read: not spammy) way of gaining as much as 1,000 followers a week in Twitter. A quick review of Twitter Rocket shows that for $97, this PDF ebook is bundled with a benefit that will help drive more traffic to your different websites or blogs. True, you get more than just the ebook. I heard from one of his satisfied customers that there’s also lifetime support plus lifetime access to updates. 1. How do you get a Twitter account? 2. How do you prepare your new account? 3. What steps can you automate? 4. What mistakes should you avoid when executing the 5-Day Plan? 5. Is your Twitter account in danger of getting suspended? 6. How can you monetize Twitter traffic? 7. What is the mindset for Twitter success? 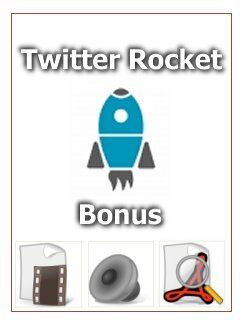 So, what are the available Twitter Rocket bonuses? Additional Twitter info in the form of case studies of other Twitter users. See what they’re doing and learn from them. Info on additional Twitter tools and tactics, so you can have a back-up plan plus other approaches to try as you implement the tactics outlined in the Twitter Rocket ebook. Twitter tutorials in audio/visual format. After 30 days: Access to other Twitter marketing ebooks, so you will gain an expanded understanding of different Twitter marketing tactics. Sorry, but the bonus doors have closed for now. You can leave a comment below if you would like the bonus doors to re-open. In the meantime, feel free to click here (affiliate link) and get Twitter Rocket if you would like to experience TR firsthand. Here’s a sample module, so you can test if your computer can play the audio-visual presentation. I’ll be creating more tutorials for you in the future. UPDATE: The tutorial has been moved to the PBN Internet Marketing Training area.